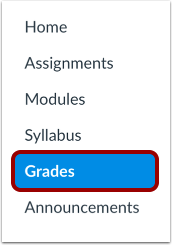 When a change is made to your course grades, the Grades link in Course Navigation adds a indicator representing the number of changes in a course since your last visit. The Grades page shows the details of your graded assignments. Note: You can also set up notifications to know when your instructor grades an assignment. A blue dot next to the assignment indicates the assignment that has been graded . The indicator disappears when you navigate away or refresh the page. The score column displays the score given to the assignment . In the Grades page, you can also see if the assignment includes scoring details, comments, or rubrics. Previous Topic:How do I know when my assignment has been submitted? Next Topic:How do I submit a cloud assignment with Microsoft Office 365? Table of Contents > Assignments > How do I know when my instructor has graded my assignment? Re: If you submitted work from school computer can you see it at home?